Do you want to support a unique research project whose goal is to prove a theory hitherto only considered a myth? A theory for which there is no evidence whatsoever? A theory which, to believe in it, you'd have to have the IQ of library paste? Geologists have been aided by Internet linking of seismographic accelerometers to conduct a CAT Scan of the Earth each time there is an earthquake. Of course, like most modern scientists, they mold the data to fit their current paradigm. The more than 600,000 seismograms have been recently analyzed by Dr. Michael Wysessions and revealed an entire ocean underneath the Atlantic Ocean. Jan Lambrecht authored a reanalysis of the seismographic data and revealed an Earth that looks quite different than the one being taught to geological students today. One with a hollow core. The interesting thing -- although not unsurprising, given that this is the sort of things that woo-woos do all the time -- is that they then go on to quote extensively two actual, legitimate geologists, Xiaodong Song and Xinlei Sun of the University of Illinois, who have researched the composition, structure, and magnetic field of the Earth's core -- but then they claim that this research supports the Earth being hollow! It's a little like someone quoting from a scholarly paper by Stephen Hawking about quantum mechanics, and then simply saying, "And therefore telepathy exists. Q.E.D." "The science is real," the website claims. "The story is more than 5,000 years old. The legend says that at a certain place above the Arctic Circle, there exists an oceanic depression or an entrance into the Earth. It's a place where the maritime legend claims sea level isn't level anymore." Because if there was a hole through the Hollow Earth at the North Pole, there would be a giant aquatic dimple. Because the ocean would be... um, depressed, because the center of gravity is actually not at the center of the Earth, it's a concentric sphere just a little bit under the surface of the Earth. The hole, they say, is where the auroras come out of, because after all, it's not like we know what causes auroras, or anything. Maybe they're not caused by cosmic rays striking the upper atmosphere. Maybe they're, like, the light from the Central Sun shining out through the Polar Holes. And, needless to say, there's a link on the site that allows you to donate to this groundbreaking expedition. Allegedly a "Park Avenue documentary producer" has already pledged $1.5 million in support. So I'm sure that when the expedition happens, and they go up to the Arctic and discover nothing but lots of ice, and no Polar Dimples whatsoever, they still will act like the "theory" was vindicated, because that kind of money does not allow for failure. And the film chronicling the expedition will end up on The This Is Not Really History Channel, where it can join other valuable scientific studies such as Nostradamus, MonsterQuest, and The Bible Code: Predicting Armageddon. All of this makes me think that I should come up with my own ridiculous theory, and propose an expedition to prove it. If I was to do that, though, I'd want to have an expedition to somewhere rather warmer than the North Pole, because I'm really not into potentially freezing off valuable body parts. So, okay, here goes: Ancient legends claim that the Earth isn't a rocky sphere with a liquid mantle and an iron/nickel core, it's actually a crispy crust over a huge sphere of butterscotch pudding. This is supported by geological studies of the Earth's composition, because nowhere in the literature will you find anyone specifically ruling out the Butterscotch Pudding Model. Actually, the fact that they haven't addressed this theory means that the dull, hidebound scientific establishment is trying to suppress the truth! So in order to prove this model is correct, I will be leading an expedition to Hawaii, because that is the spot where the crispy crust is the thinnest, and also because I can spend a lot of time clad in nothing but swim trunks and drinking margaritas. In the end, the research (which will consist of a visit to Hawaii Volcanoes National Park and several scuba diving trips) will unfortunately turn up no evidence of butterscotch pudding, a finding that I will label as "inconclusive." Interested? Please forward your check for $1.5 million to me at your earliest convenience. Funny how these "theories" never address the problem of how such an Earth could have formed. Did some alien ship come by, spit it in half, licked the inside oreo-like and put it back together? That's quite the 'hole' in their "theory". 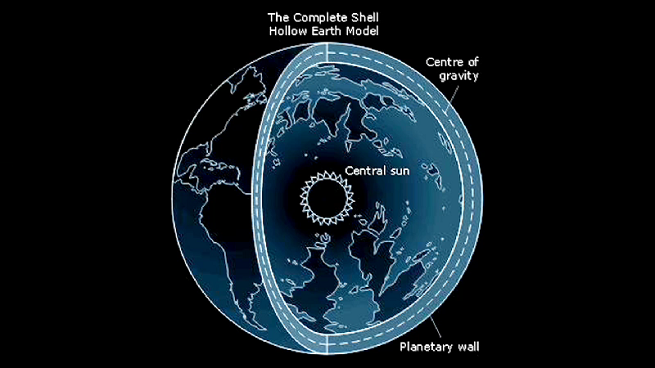 So we have a sun in the center of our Earth, but it's not the center of gravity? ...and over millions of years, the Earth, being apparently hollow, hasn't imploded into it? The only conclusions I'm drawing are that these people are idiots.